What really impressed me most about that part of Citrus County was all the palm trees. 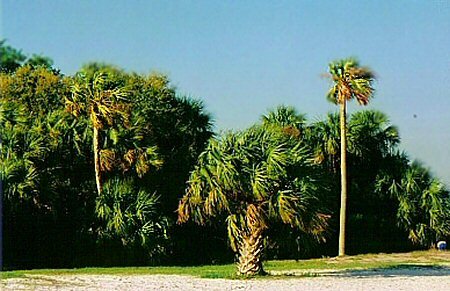 Is there such a thing as a 'palm barrens'? Because that's what we saw driving out to the point. I don't ordinarily photograph clumps of trees, but this particular one has an unusuall dimensional aspect. Perhaps it's all the different greens that give this effect; or the depth of the shadows contrasting with the brightness of the sun on the palms in front. I don't remember taking this photo; I'm thinking Don must have, though it isn't the sort of photograph he usually liked either. At any rate, I find it really beautiful (or perhaps more accurately, I find the scene it evokes really beautiful).